Aqua is a Danish eurodance group, best known for their 1997 breakthrough single "Barbie Girl". The group formed in 1989 and achieved huge success around the globe in the late 1990s and early 2000s. The group released three albums: Aquarium in 1997, Aquarius in 2000 and Megalomania in 2011. The group sold an estimated 33 million albums and singles, making them the most profitable Danish band ever. In their prime, Aqua’s singles managed to chart top ten in a number of countries where European pop acts would not normally succeed, including the United States, Canada, Brazil, Australia, and Japan. The group managed to top the UK Singles Chart with three of their singles. The group also caused controversy with the double entendres in their "Barbie Girl" single, with the Barbie doll makers Mattel filing a lawsuit against the group. The lawsuit was finally dismissed by a judge in 2002, who ruled "The parties are advised to chill." 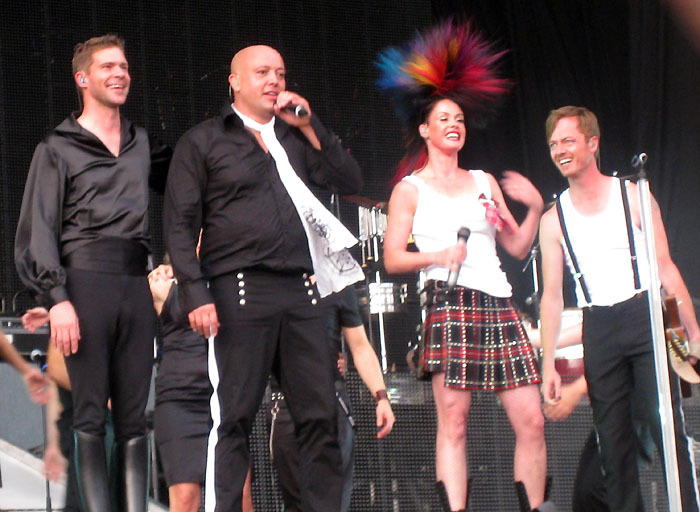 The band’s members are vocalists Lene Nystrøm and René Dif, keyboardist Søren Rasted, and guitarist Claus Norreen. During their split, Nystrøm, Dif and Rasted all achieved solo chart success, and Norreen continued in the music industry remixing other artists’ material. At a press event on 26 October 2007, the group announced a reunion tour, as well as the release of a compilation album featuring new material. Their third album, Megalomania, was released on 3 October 2011.